I know lots of celebrites have their own clothing labels, and they all vary in style and quality. But one fashion label that I do like is Sienna Miller's 'Twenty8Twelve'. Sienna, alongside her sister, Savannah, started up this fashion line, back in 2007. They got the name from Sienna's birthday (28th December). Personally, I would call Sienna Miller one of my style icons. Shes one of the people I google when I'm lacking inspiration for outfits. The collection itself is very stylish and wearable. Its quite grunge and one of their key staples are leather jackets. I also love some of the t-shirts featured. You can get a lot of the collection from Asos, Bluefly, Harvey Nichols, Saks Fifth Avenue, Revolve Clothing and a lot more designer stores. So what are you waiting for? Check out the collection adn let me know what you guys like from it. P.P.S. The Timeless 50 are giving away prizes everyday until the 15th December. Todays prize is a gorgeous pair of Louboutins. I love Sienna's style and her runway collections are very trendy and chic. I love Sienna's style as well... she always comes out so effortlessly chic. And her runway collection is so wearable. I didn't even know she had a clothing line, thanks for sharing!! Thanks for sharing. I was unaware of this label until now but it looks really great. Sienna is one of my style icons too! 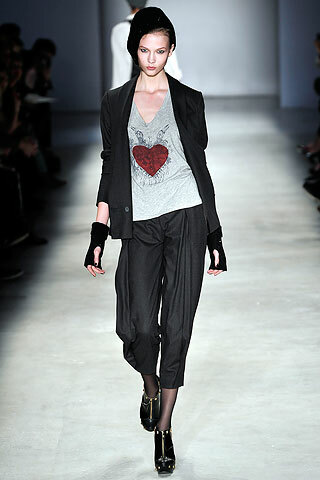 And I love her label... the designs are very no-nonsense and so spot-on in most cases. Could easily buy most of the current collection if I had $$$! Twenty8Twelve really has some great pieces. I'm especially loving the last two dresses in the Autumn/Winter '09 group. Gorgeous! I bought a twenty8twelve skirt in a sale a couple of years ago and was not disappointed, Sienna Miller definitely has style and is a great designer as well, as proved by the longevity of the line, unlike a lot of celebrity fashion lines! I also like that it's expensive, but not totally out of the reach of the average person. I love Victoria Beckham's line of dresses for example, but it is way way too expensive! I haven't seen her collection before! It looks amazing actually! Which really shouldn't surprise me because she does have great style! i absolutely love this line! Sienna is definitely a fashion icon in her own right. I had no idea about this line, thanks. They all look like things that she'd wear... haha... which is a compliment. Gorgeous AND wearable. I've been reading your this new brand for some time in magazines and I've loved every item I've seen so far. wow, I had no idea. so cool. i dont mind the collection. i think it helps that savannah is a real designer. I didn't know that they had a clothing line either! Thanks so much for letting us know, what darling clothing! I love Twenty8Twelve as well, and their SS10 collection is gorgeous! I do love twenty8twelve and how wearable the pieces are! What a great line! this is one of the few celebrity lines I actually like! Well, duh, it IS Sienna... and she is fab! did you see her on the September Issue? even without makeup shes was fab! When I saw their collection on the runway this past season, I was fairly surprised. It was all VERY wearable compared to all those avant garde pieces. I love everything about Sienna. She is such a doll. I had no idea she had a fashion line. That is beyond fab. I will definitely have to check it out!